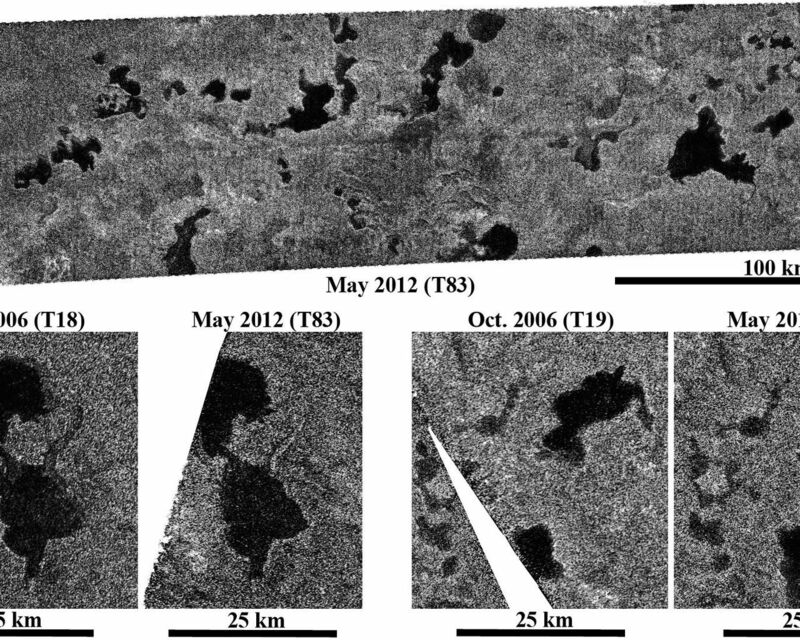 These images obtained by NASA's Cassini spacecraft show Titan's stable northern lake district. Cassini's radar instrument obtained the recent images on May 22, 2012. 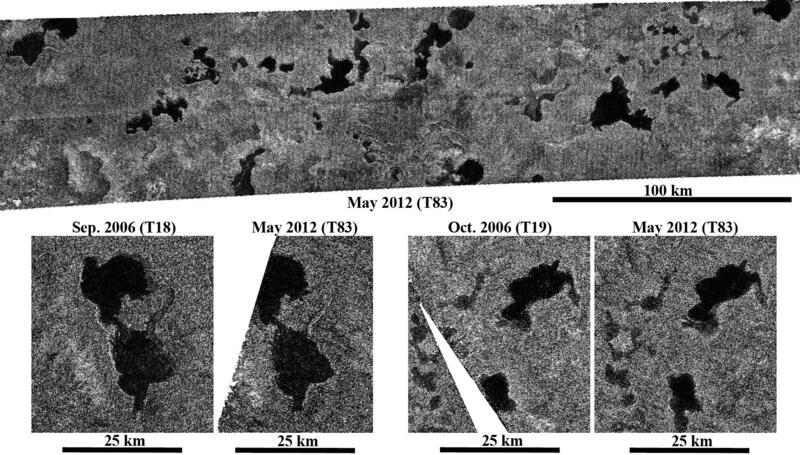 It observed some previously unseen regions but also some regions containing lakes that were last observed about six years -- nearly one Titan season -- ago. This marks the longest time interval between lake observations in the northern hemisphere. The top image here shows part of the radar swath from May 22, 2012, centered near 79 degrees north latitude, 58 degrees west longitude, and about 220 by 47 miles (350 by 75 kilometers) in dimension. At the bottom, parts of this image are compared with those obtained in 2006. (The images appear slightly different from previous releases because they use a new filtering technique). In 2006, it was winter in the northern hemisphere and the lakes were in the dark. 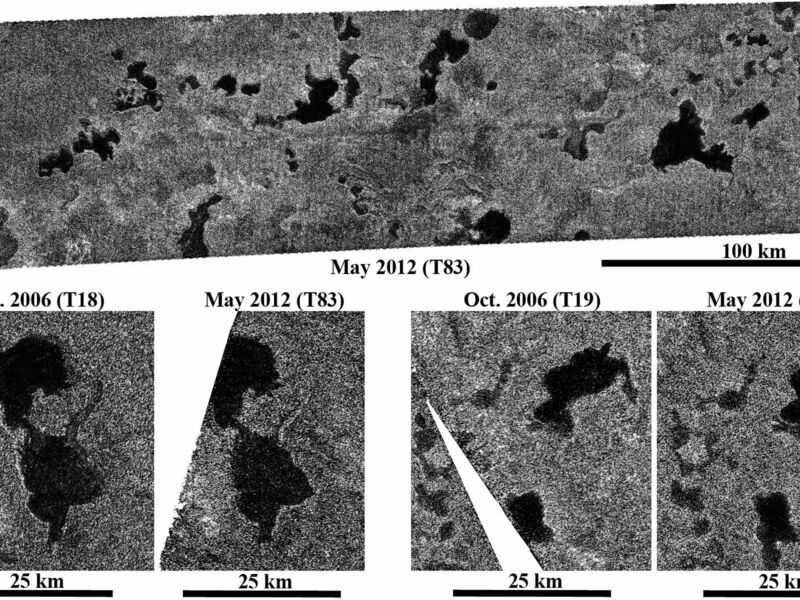 Although Titan spring began in 2009 and the sun has now risen over the lakes, there is no apparent change in lake levels since the 2006 flybys, consistent with climate models that predict stability of liquid lakes over several years. This shows that the northern lakes are not transient weather events, in contrast to the temporary darkening of parts of the equator after a rainstorm in 2010 (PIA12819). Changes in lake levels may still be detected later in the mission as Cassini continues to observe these high northern latitudes into the beginning of summer in 2017. At that point, the sun may cause evaporation. 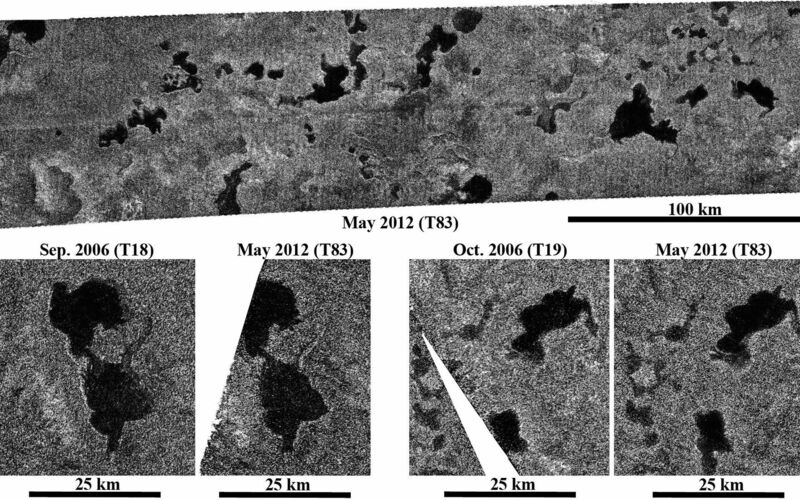 However, the lack of significant change over six years sets important constraints for climate models and the stability of liquids on Titan. Illumination is coming from the bottom.